In November 2013, when Typhoon Yolanda (Haiyan) hit Visayas, I wanted to respond. But I really didn’t know how to be of help. I had this urge to go to Visayas, however, I realized that I might just add up to the chaos and so I stayed. All I know is that I just wanted to do something concrete for them and so I joined relief operations. It was a fun experience. We had a daily dose of inspiration from volunteers and corporations but as the operations were about to end, a thought came to my mind. How long will these food packs last them? How can they get back on their feet? I can still remember that day. It gave me goosebumps (even until now). 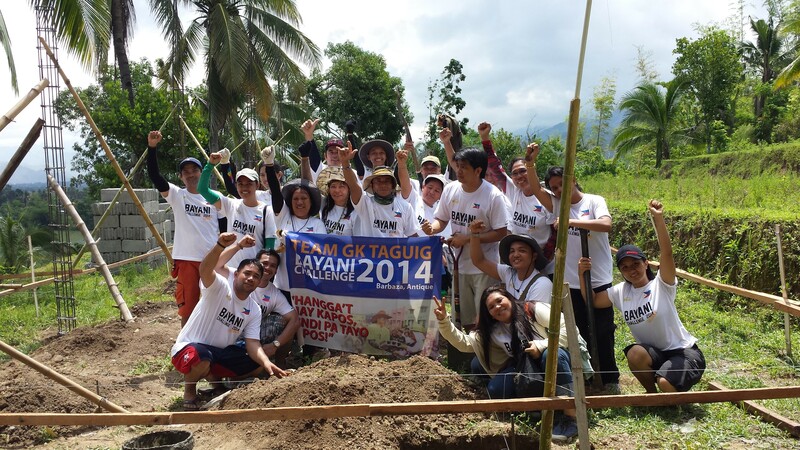 In January 2014, the GK Taguig Caretaker team (GK Community Leaders and Management team) boldly decided to join the rebuilding efforts for Visayas. We wanted to put up a GK Taguig Partners Village for Yolanda victims and everyone will play a part. Our GK Taguig Head, Eric Abad, posted a challenge to the Kapitbahayan (GK residents) to raise funds for a house by sharing 200 pesos per family. Without hesitation, their response was a resounding “Yes!” to paying it forward. Coincidentally, days after, I attended a mass held for Graduate students. The priest that officiated was affected by Yolanda. I was reminded that another year may have passed, but those affected by the typhoon should not be forgotten. I noticed that the profile of the individuals in that mass were mostly young professionals. Majority of them did not have a family of their own. Inspired by the beneficiaries response, I abruptly told the girl sitting beside me, “If I ask for 5,000 pesos from 25 friends, to build a house for a Yolanda Family victim, would you want to be part of it?” and she surprisingly said she would. Then, I shared to another friend about the idea (in the middle of the school’s hallway). I stressed the point that these survivors have gone through so much, and our response should be equally life changing. Besides, what is 3,000 pesos for yuppies, when they can easily buy shoes or even a dress with that value? However, I also figured, the amount should somehow hurt our pockets but I didn’t want to paralyze the donor. Then he said “Yes” again and even said he’d invite our friends. Excited with the number of pledges I was receiving within just hours, I decided to come up with a campaign and called it 5 from 25. I made a simple poster using my phone application and posted it on Facebook. Knowing the power of social media, I asked friends to share and tag their friends as well. I’ve gotten many people interested from schoolmates, Filipino friends (in PH, Australia, and Ireland), family and workmates. I even did a countdown so that they will be in a rush to pledge money. I received text messages from people telling me to hold a pledge for a couple of minutes while she gets confirmation from friends. There’s also one guy that donated his very first payroll because he was blessed and wanted to share it to others. 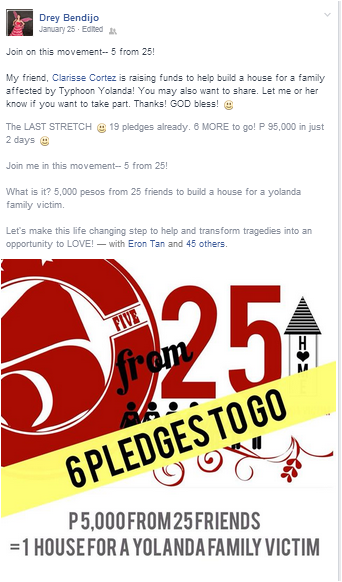 Within 3 days, I got pledges from 25 individuals, which would equivalent to 125,000 pesos. During the collection time however, only 22 gave money at once. The other people that pledged were not replying anymore to my FB message and I always ended up on the “SEEN” zone. I was really down that time and even asked the Lord why this is happening. I rechecked the others that wanted to donate before. But they weren’t able to make a budget for it, and as such, they declined. Clueless on what to do, I prayed. "I am moved to see how hearts are connected despite the distance and nationality. 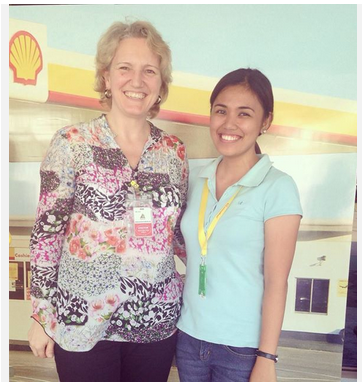 Christiane, Austrian and Shell colleague shared that she wanted to help Typhoon Haiyan (Yolanda) victims in her visit to Manila. It came to me as a surprise because it was my first time to have met her and that she felt the need to help. Coincidentally, a few days ago I was also looking for donors for our Gawad Kalinga site in Antique (also an affected site) and was worried where to get it from. How great to see prayers get answered and how blessings are revealed through strangers. PS. We are still trying to raise (money) for two more houses. To those who want to contribute in any form, please let me know." After I posted, there’s this one particular guy who messaged me about it. His name is Hernan Ilagan. Hernan was a Filipino based in Singapore, a Shell Colleague, but I have not met him at all. He asked, “I saw your post Re: GK paano mag donate para sa bahay?” (Referring to the Christiane post). I knew I still had a balance of 10,000 pesos (2 more pledges). I thought to myself that maybe it would be great if he can also do the same activity. So I shared the details of the campaign to him via chat; secretly hoping that he would consider doing a campaign in SG as well. He said he would try and after a few hours he did get the same response. He told me that he is so inspired and is getting excited about every message by friends. I told him, people are good by nature. They just need to be linked to a greater purpose. Within a few days, he was able to finish his pledge list by Easter and by May 1, he transferred the money to GK. I also asked how much is the equivalent of 5,000 pesos in Singapore dollars and he told me that its 143 SGD which made me smile even more. I told him “Oh! It’s like 25 individuals are saying I LOVE YOU to Visayas”. Moreover, I was also able to finish my list when some friends offered to give money after sharing about the SG story. I was able to finish just about the same time as Hernan’s. I realized during the course of the event that our plans are so little compared to what the Lord has in store for us. He made waiting so beautiful and meaningful. We only dreamt of having one house but we even ended with two. I honor each individual that responded to loving strangers. It is in individuals like them that make the world a little brighter and inspire us to continue to dream higher for our country. Lastly, next time we log in, know that we also have an opportunity to rebuild lives. Let’s be bearers of good news in social media. 50 people made that choice and hope you will too. 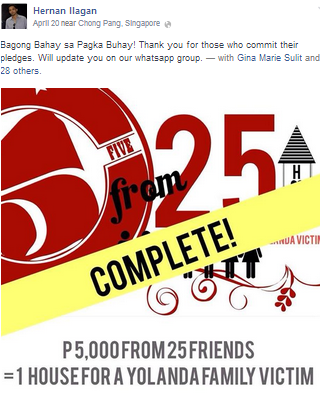 As of this writing, another volunteer is starting a 3rd batch of “5 from 25” campaign in Singapore. Like Clarisse, you too can be part of Operation Walang Iwanan and help GK in RAISE FUNDS for reconstruction.